If you enjoy good quality coffee. This Temple in Sacramento can teach you something about coffee. 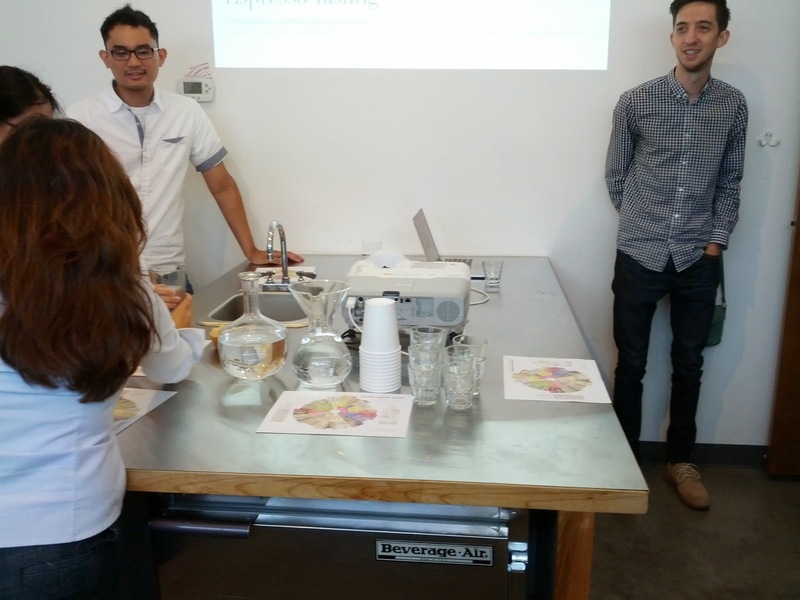 Last Saturday I took a class with them: Espresso Tasting Class. In this class I got the chance to taste 5 different coffees prepared by experienced baristas. An education about flavor, color of creme, consistency and persistence of creme, taste balance (harmonious balance of sweet/acidity/bitter), and tactile balance (body and roundness). I also received a 12oz bag of beans. I got an e-mail two days prior to the event to remind me to eat before the class because I was going to drink lots of coffee. :-). I am glad I followed their instructions because I don't think the lining of my stomach could have survived this class without food. The class is held at their training facility, which is located next door to the coffee shop. This room is where Temple trains their baristas before going into the floor. If my memory does not fail me (I am sure Temple will, if I am mistaken), future Temple baristas are required to train for a 100hrs, 5 days a week, 8hrs a day. I am sure they will not put a not qualified barista in the floor, after all it is their reputation what it is at stake. The instructor for the class was Cole, and our main barista was Kelly. They were excellent, Cole has a lot of knowledge, and the explanations were simple and effective. I stated in this blog before that making coffee is an art. Temple respects it. The class has a 20 person maximum however I don't know how would they manage that amount of people because we were 11, and it was a good turnout. 20 people in that room… sardines in a can. We got the good, the bad and the ugly of espresso making. These are some of the facts that stood out for me in this class. ❤ There is no X in Espresso (I thought it was a very witty comment). ❤ Espresso needs to be drank right away after being made. ❤ The color of the crema tells us if the beans were under extracted, over extracted or just right, but it doesn't mean if the espresso is going to taste good or not. ❤ Geisha Beans are a very high end beans, very rare. It is a very temperamental bean that thrives in high altitudes. If interested Temple sells it during Christmas time. I would recommend the class for espresso drinkers because this population will get a lot out of it. 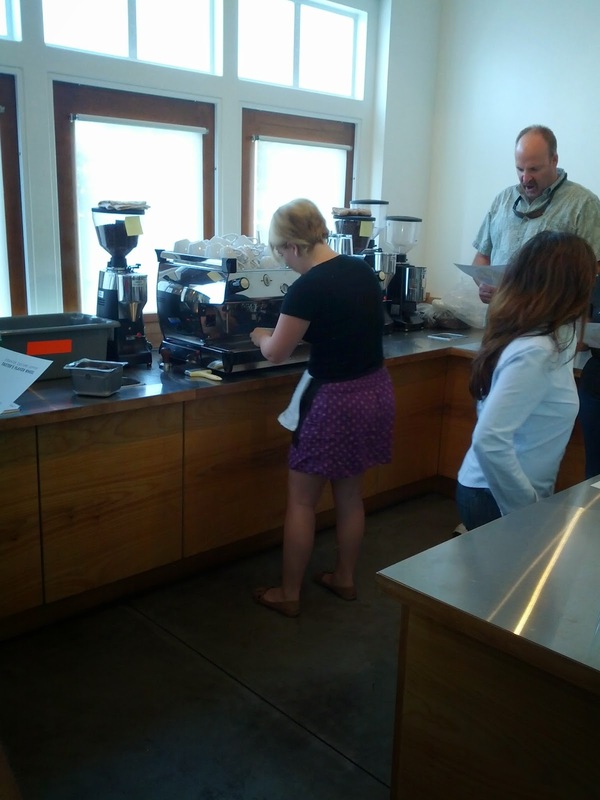 I enjoyed the class, all the knowledge, and watching Kelly preparing all the espressos. I am going to follow Cole's recommendation: "Get things in to perspective - Do you like it?". My palate is not made for espressos. I could tell the difference between the different beans, however it went from less bitter, to more bitter, to.. I am sorry I can not drink this (Ethiopian). I did not taste anything fruity, floral or nutty. I do understand it is teaching my palate to differentiate the flavors but I know my stomach will not tolerate that type of punishment. I am sticking to my cafe latte. After the class, I went to their coffee shop, which is next door, and I got my cafe latte with a pastry, of course. I sat down outside in their patio. They brought my drink outside, and it was beautiful. I totally enjoyed my visit to this Temple. It will not be my last class, nor my last cafe latte.